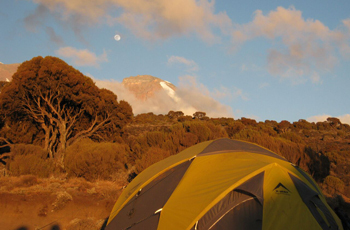 Six route options take climbers to the summit of Kilimanjaro. These are Machame, Marangu, Rongai, Umbwe, Lemosho Glades and Londorosi. Depending on the route, trips spend four to six nights on the mountain itself. Marangu and Machame are the two most popular routes. Expert guides and porters accompany you on the whole climb and no technical equipment is required. Weather and temperatures on Kilimanjaro vary day-by-day and by altitude! Ensure that you have the gear specified on the equipment list. The main rainy season is from April to the end of May with shorter rains in November. This is not a recommended time to climb Kilimanjaro. Trips can be scheduled in these months, but then expect more rainfall than ‘usual’. The rest of the year is great for climbing. Pick a full moon date for your summit night. Below is a brief description of each of the routes and the costs for a climbing package. The detailed list of what is included in these prices is laid out below these route descriptions. 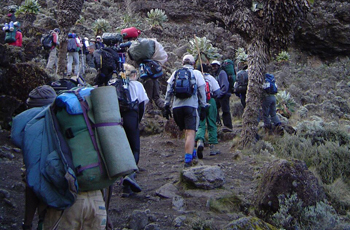 Known as the ‘main route’, the Marangu Route is by far the most popular. This is most likely because accommodation on the way up and down is provided in mountain huts which are equipped with basic necessities. It usually takes 5 days / 4 nights for the round trip. An extra day and night, for acclimatisation at Horombo Hut on the ascent, can be added to make the trip duration 6 days / 5 nights. The supplementary cost for an optional extra day is indicated separately. 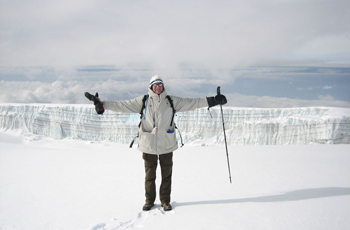 The Machame Route is touted as ‘the most beautiful route up Kilimanjaro’. Accommodation on the way up and down is strictly camping only in mobile tents. This route is more physically is strenuous is better suited to more adventurous hikers. 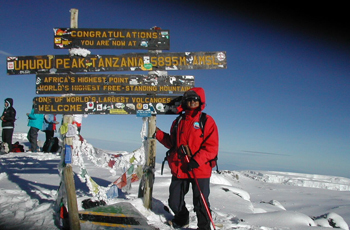 The Machame route is normally completed in a minimum of 6 days / 5 nights on the mountain. It is a long drive to the starting point of the Rongai Route and as such is one of the least used routes. This is an ideal for novice hikers if done as a 7-day hike because daily distances are shorter and less steep compared to other routes. The trail begins on the northern slope of the mountain, offering views into Kenya, and descends via the Marangu route on the south-eastern side. Climbers are accommodated in tents. The Umbwe Route is the shortest in distance but it is the steepest and ascent is rapid, especially on the first two days. This route is quieter than Machame and Marangu routes, which will appeal to fit climbers that prefer to be away from the crowds. 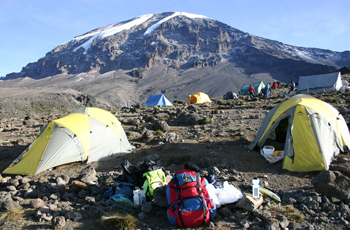 Climbers are accommodated in tents and while usually done in 6 days/ 5 nights an additional day for acclimatization can be added. Single room & tent supplement from USD 87 per person. The Lemosho Glades Route is really off the beaten track. The trail starts in forest and passes through areas rich in fauna and flora. This is a quiet route where you are unlikely to encounter others climbers for the first few days, until you join more popular routes. Scenery is incredible, wildlife is more abundant and accommodation is in tents. 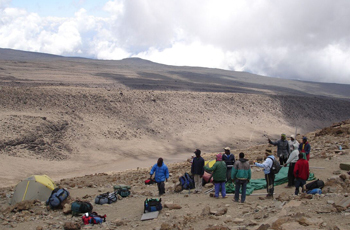 The Londorosi Route is also a camping route, and takes a shorter village trail to ascend Shira than the Lemosho route. Both routes are picturesque and interesting. The routes merge at the Shira Hut. The trail crosses streams along the Shira plateau and offers scenic views of the Western Breach Wall of Kibo. This is a 7-days / 6-nights route. Good guiding gets you to the top and makes your experience on the mountain memorable. Local guides have years of experience on all major routes - including those with technical climbing. A number have attended training in the US and on Everest. Guides frequently attend a Mountain Rescue refresher course as well as Rope Courses. They have also completed first aid courses and they are regularly updated on emergency scene management, artificial respiration, rescue CPR, choking, wounds and bleeding, shock, unconsciousness and fainting, fractures, burns, and head and spinal injuries. Guides provide motivation and are there to look after your every need to see you safely to the top. With a high guide and porter to climber ratio, you can be assured that your safety and well being is priority. For groups with disabled or elderly members, more staff are included. For a group of six hikers without special needs, 24 staff members (one senior guide, two additional guides, two cooks and 19 porters) make up the crew. A group of 16 people requires one senior guide, six additional guides, four cooks and 53 porters for a crew tally of 64. Local Chagga people are employed to make up the crew required to run a safe operation. Porters carry all equipment used by the expedition group to establish camp each night. This includes tents, tables, chairs, mess tents, all food and cooking utensils, gas cookers and also climbers’ personal gear as well as their own gear. A large porter crew ensures that individuals are not overloaded. As every person on the mountain has an effect on the environment, crew and climber ratios are calculated to combine safety and comfort with limited environmental damage. Crews appreciate tips at the end of the climb. This is an additional way for you to thank them for the hard work that they put into making your climb comfortable and enjoyable, whether you reach the summit or not. Our tipping system is transparent and fair and ensures that tip money is fairy distributed. Tipping guides are provided.